​Relive the trauma of the Game of Thrones' Red Wedding all over again! Kudos to HBO for this marketing campaign for the Game of Thrones season three set, which leads this week's home video releases. There's barely any show footage, just videos of people reacting to the infamous "Red Wedding" sequence in shock which will sell more copies than a regular trailer ever could. With countless featurettes, audio commentaries, deleted and extended scenes, the requisite guide to people, places and events, and so forth. What I'm most excited for, though, is hearing Sansa, Bran and Arya's new version of the opening theme. Criterion Collection heads back to the Wes Anderson well, thus ensuring they have the money to release another 50 obscure, foreign, important movies. Works for me. Beginning the Namek/Frieza stuff. Remember, this release is on Blu-ray, but has been rec-ropped to fit widescreen TVs. Which is the price you pay if you want an anime series made in the '90s to suddenly become widescreen. Of course, you could just pick up Dragonball Z Kai, which is widescreen, but not the original show. Because the original show was made in the early '90s. When no one did widescreen. Sam Raimi's cult classic superhero movie (as opposed to his non-cult, fairly recent superhero movies) gets a super-special edition from Shout. Even Liam Neeson returns to talk about it in the extras, and he's both proud of it and happy with it! Good stuff! Two Japanese high school kids want to build a robot based on their favorite anime, and receive help help from a sentient AI — but its information doesn't come without a price. 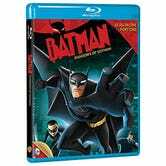 Although Cartoon Network still hasn't resumed airing Beware the Batman, you can finally pick up this release of the first 13 episodes, many of which haven't aired yet (...and almost certainly never will.). When Naruto is wrongly convicted of a crime he didn't commit, he gets sent to special ninja prison. Some demons are so powerful that the only way to send them back to hell is to let them possess someone, and then kill that someone. So a group of rogue priests purposefully debauch themselves to ensure that if the need arises, they can be possessed, killed and consigned to hell in order to rid the world of these demons. That sounds AWESOME. Dolph Lundgren and robots fight zombies and a very, very small special effects budget. An international arms dealer and her cold-blooded child soldier travel the world for money and vengeance, which sounds incredibly messed up, even for anime. Asylum's Pompeii rip-off. I'm mentioning it solely to comment on the fact that I love how the Pompeii trailers make it appear that Jon Snow is personally going to be fighting the volcano and could, theoretically, win the battle.